So getting organized is all fine and dandy, but what if home organizing means that your home now looks like a tax accountants office? Not really the look you’re goin’ for? We hear you. 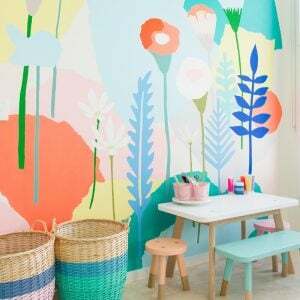 So whether you are getting ready to organize your home, do some office organizing, or just find a new way to store things in a prettier way, take a look at this. These 12 filing cabinet makeovers take that ordinary, not very attractive (but necessary!) piece of the organizing puzzle and make them awesome. Not just tolerable, not just “not ugly”… but awesome. So awesome, you don’t have to keep them hidden away in a corner of the guest room, or tucked into a closet where no one can see them. 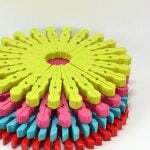 Give these easy and fast DIY projects a try! ‘The Painted Hive’ shows us how to make this really cool industrial farmhouse look filing cabinet with her easy tutorial. 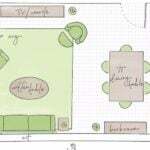 Step by step photos make this a simple to finish project. This started out as a plain old metal file cabinet, so you can do this too! 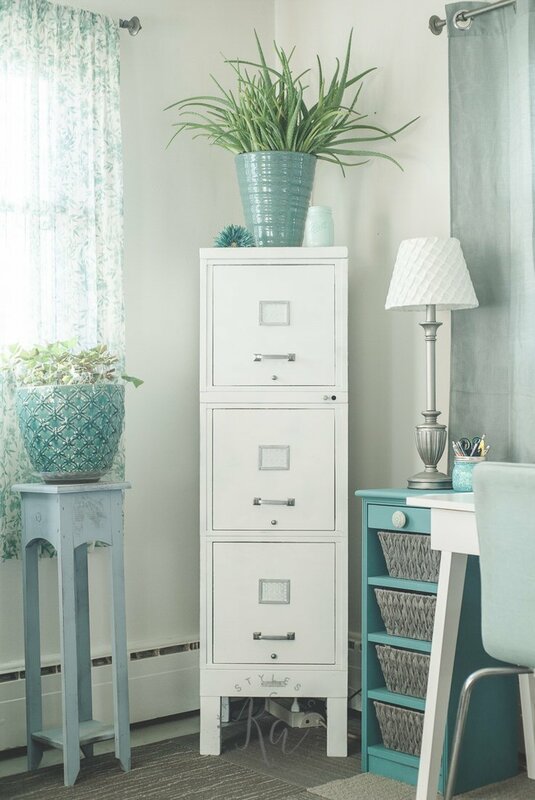 This dated file cabinet makeover is by ‘Simply Beautiful by Angela‘. You need to go see the “before” of this filing cabinet to appreciate how gorgeous this is! This is such a fun project, and it just took some chalk paint, some antiquing wax and a few details. 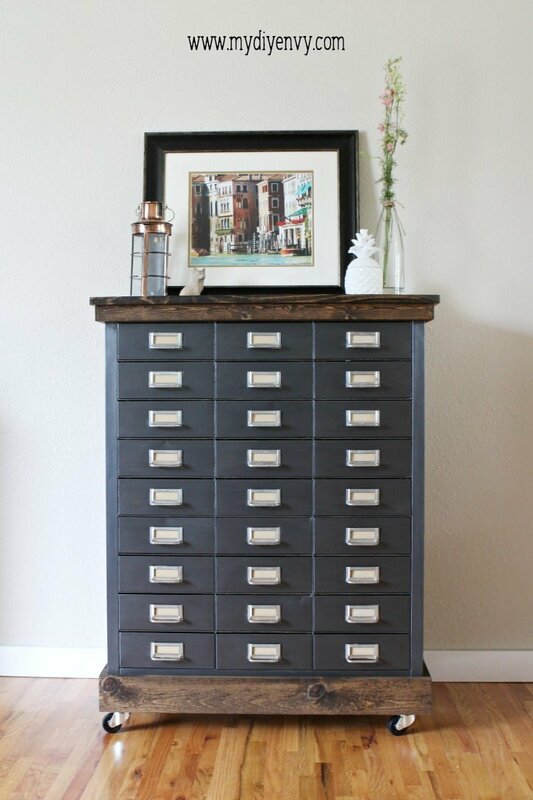 Brooke at ‘All Things Thrifty’ took a 99 cent filing cabinet from GoodWill that looked like a beat up old metal box, and turned it into this. 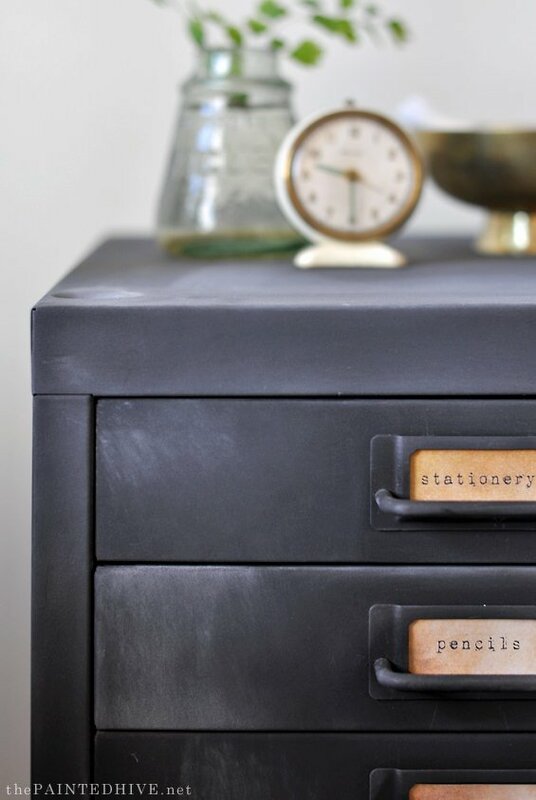 This chalk painted filing cabinet is so pretty, and has a touch of Mid Century Modern to make it on trend. Love these legs! 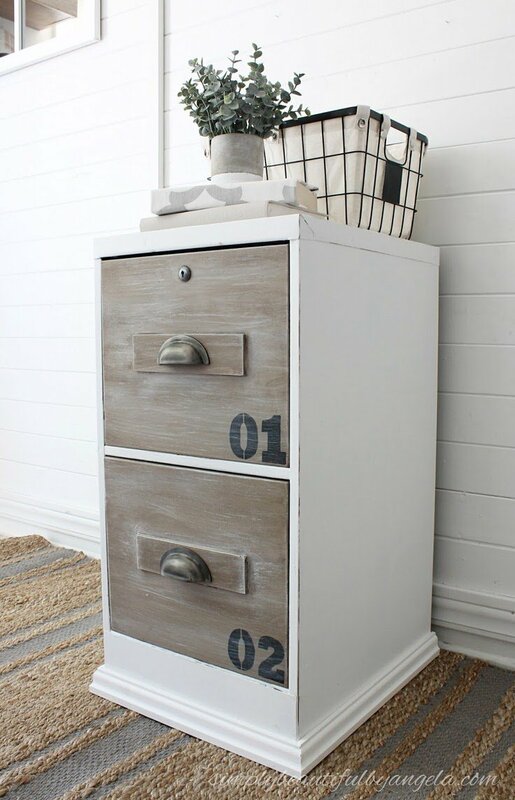 Easy to follow filing cabinet makeovers tutorial. 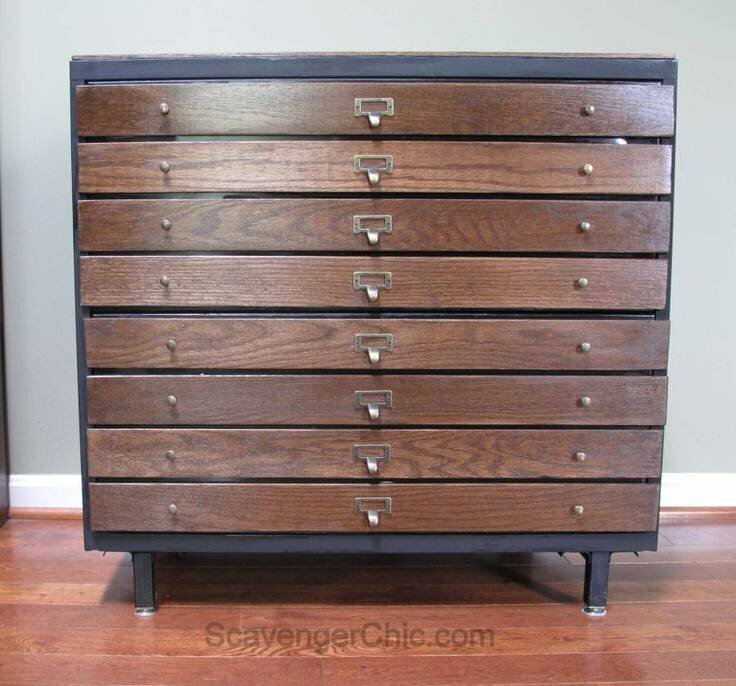 The original inspiration for this Pottery Barn knock off file cabinet cost almost $600. Yep, you read that right. Luck is with us, because we found this project tutorial from ‘BrePurposed‘ that nails this look. And she did it for $45! And now we have a project that goes a little beyond these filing cabinet makeovers! 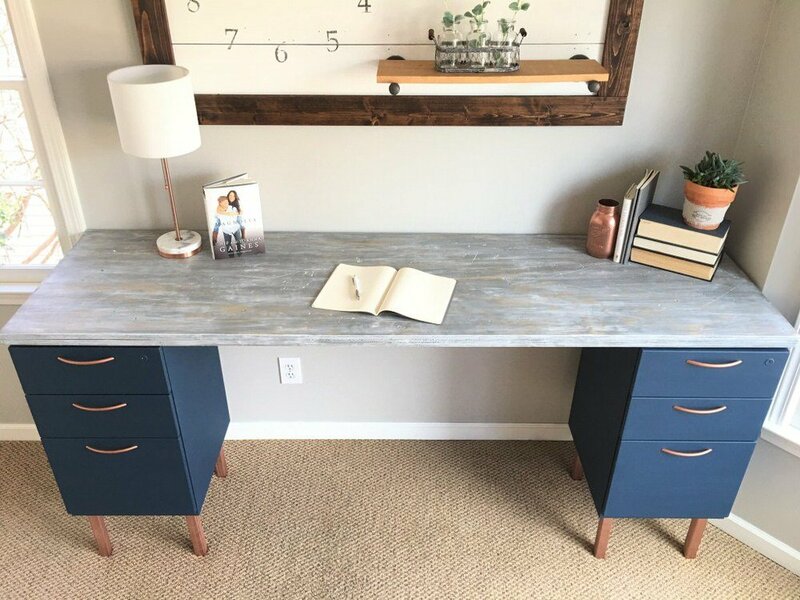 ‘Beautiful Life Market‘ made this DIY desk with filing cabinets as part of their ugly home office makeover. So not only did they makeover the cabinets themselves in this amazing Navy and copper look, (LOVE those legs!) they made a desk top too! ‘KA Styles‘ took a 100 year old file cabinet and turned it into a gorgeous piece… So love that she has a story to go with this piece of history. They don’t make filing cabinets like they used to! 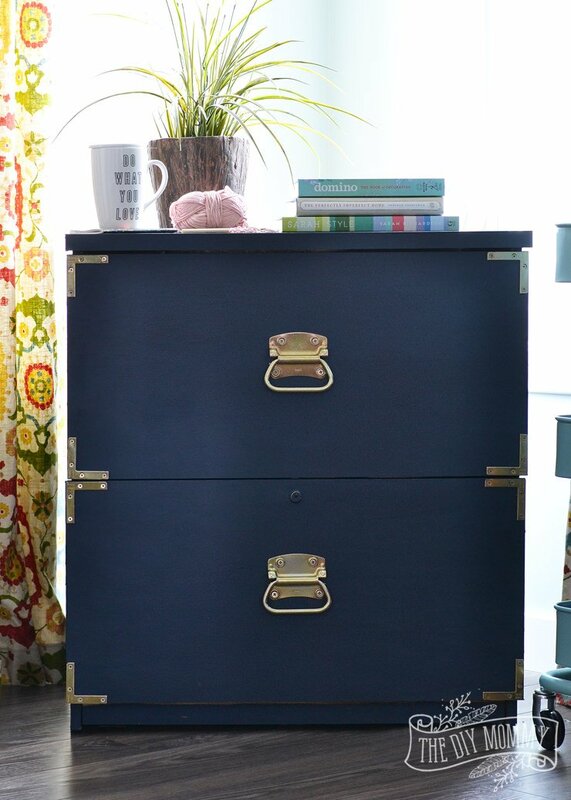 This DIY filing cabinet makeover is from ‘The DIY Mommy‘. Her campaign style filing cabinet project looks classy and chic! And we are loving the navy chalk paint. 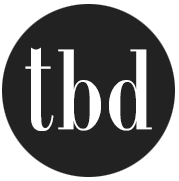 (Did you know you don’t have to prime when you use chalk paint?) This piece looks like a high end dresser, not a file cabinet makeover! Oh my. This may be a fav. 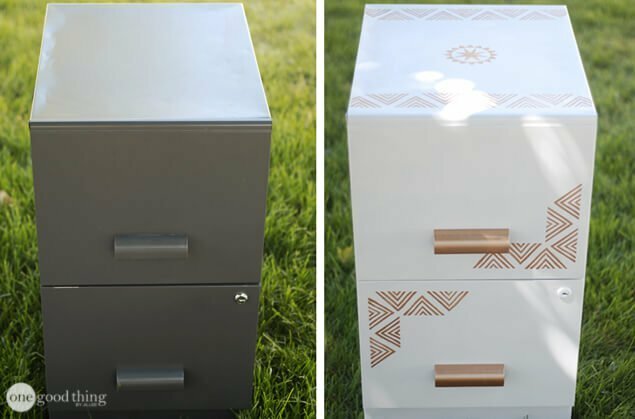 This filing cabinet makeover is ah-mazing! From ‘Scavenger Chic‘, she used chalk paint, oak boards and a little bit of time to turn this into a pretty piece ready for any room in your home. Complete and easy to follow tutorial. She did have one problem during her project though. As a result, she gives you a very valuable tip on what kind of adhesive to use, and what not to use. 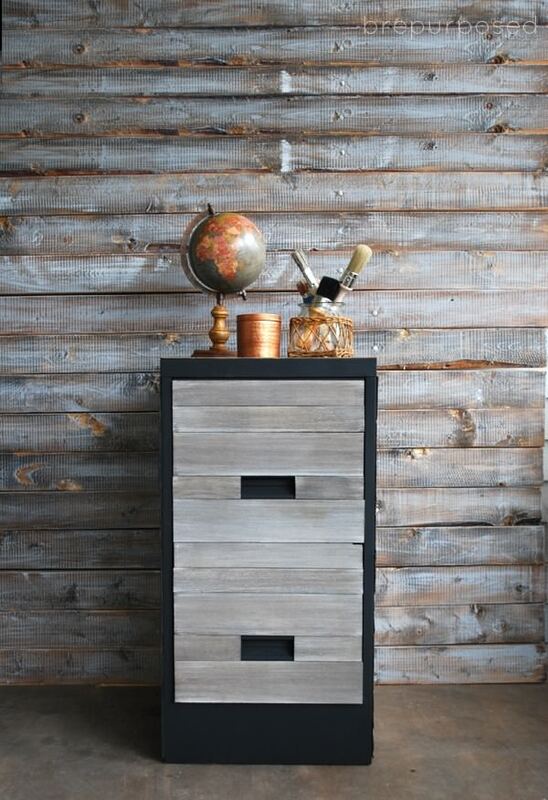 Transform an old, rusty file cabinet into this modern statement piece with this tutorial from ‘Curbly‘. I love the fresh colors they chose, and the gold hardware! This is another filing cabinet makeover that fits right into my “Fav” category. Jes from ‘My DIY Envy‘ took this simple metal cabinet, and turned it into a high end looking piece. I love the casters to make it portable. I could see this sitting in a Restoration Hardware showroom and would never know it was a DIY. Love! 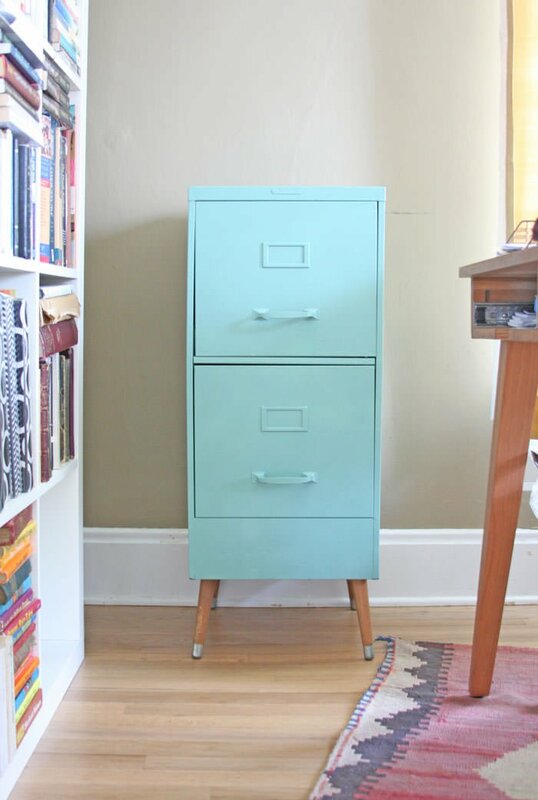 This vintage file cabinet makeover with Mid Century legs is a modern pop of style and color. From ‘Lovely Chaos‘, this project requires some paint and… those amazing legs! It’s always all about the legs, isn’t it? 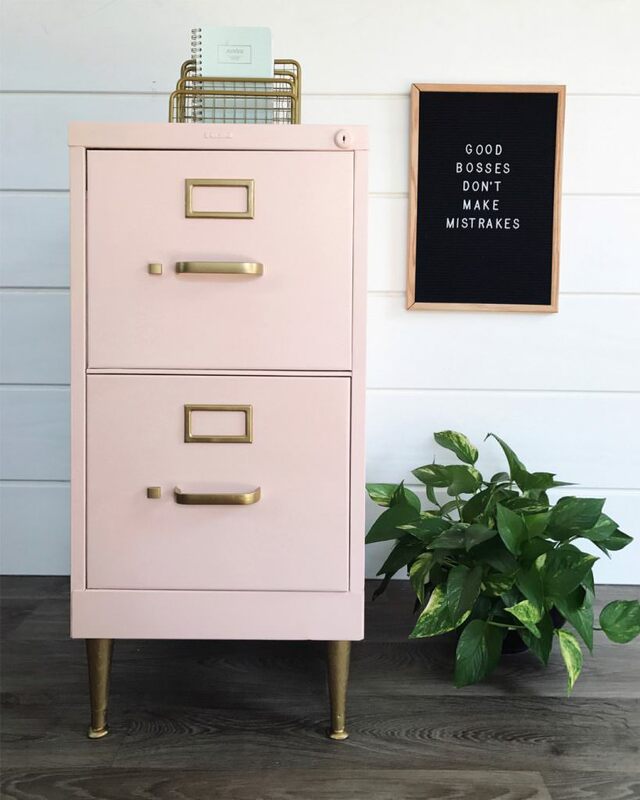 Finally, we have this rose gold and white filing cabinet DIY project from ‘One Good Thing by Jillee‘. 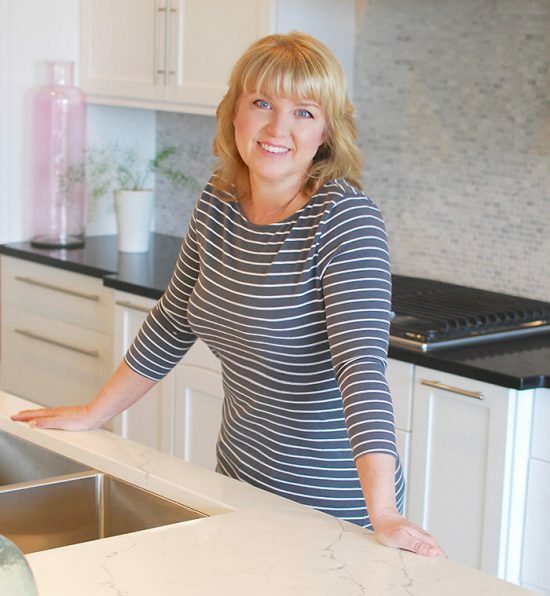 We love the geometric details on this piece, and she shows you exactly how to do them! 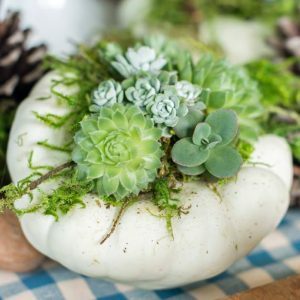 Easy to follow tutorial, and a fun and fresh finished project. 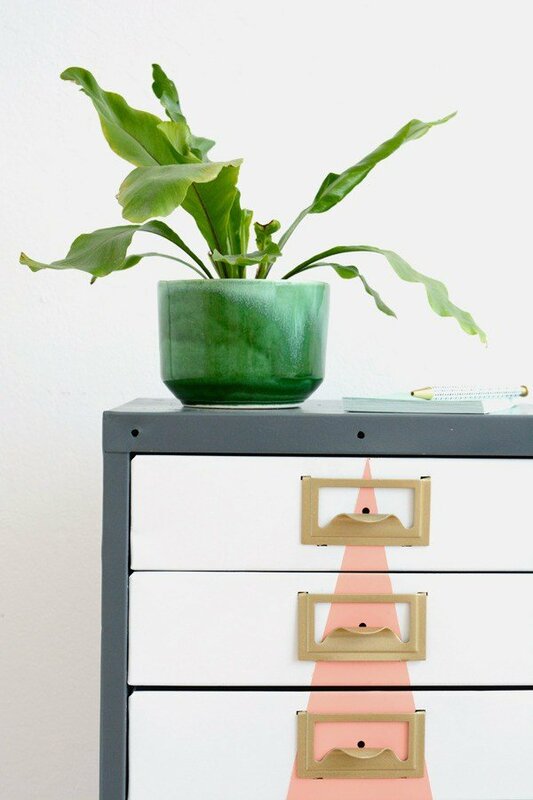 Did you love our round up of DIY filing cabinet makeovers? Thought you would! Now jump on over to our posts on Craft Room Ideas & Projects, or DIY Entryway Makeovers! We are in the process of decorating my husband’s home office in a nautical theme. After much thinking and discussion, we are converting two wooden file cabinets to give the appearance of a captain’s chest. Then we’ll top it with off some type of board to create a smaller desk than the one he currently has. He really needed the file space more than the desk space. Your article was very timely! Thanks for added suggestions! EVERYONE make mistakes! Even GREAT BOSSES!